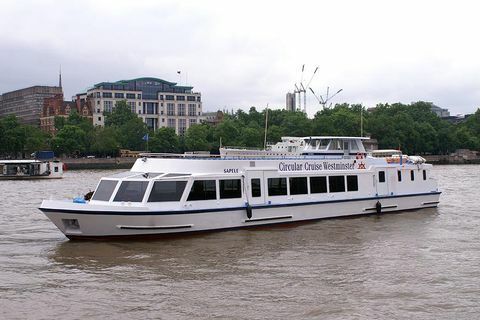 Formed in 1986, Circular Cruise Westminster is a sightseeing service between Westminster Pier and St Katharine’s Pier, adjacent to Tower Bridge. On the eastbound route, boats stop at Embankment Pier, Festival Pier and Bankside Pier. It’s a non-stop route to Westminster on the westbound, return journey. Crown River Cruises and Westminster Party Boats joined to form the Circular Cruise Westminster and, as such, there are 3 boats – Sapele, Mercuria and Sarah Kathleen – all of which have a fully licenced bar on-board, as well as multi-lingual commentary.